Irreverent media company Vice Media, which has gained a reputation for its video reports from Russia, has launched a new international online news channel under the name of Vice News. Vice’s commercial director for Germany shared his thoughts with RBTH. In mid-March 2014, irreverent media company Vice Media launched a new international online news channel under the name of Vice News. While the company describes itself as the world leader among youth audience media content providers, Vice also bases its product on expert reporting and investigative journalism. Since its early days as a global resource, Vice’s team of reporters and editors have repeatedly returned to Russia, and eagerly admit their fascination with the country. In 2011, Shane Smith, the founder and director general of the company, traveled from Moscow to Khabarovsk by rail, eventually ending in North Korea, where he released a seven-part documentary titled North Korean Labor Camps. Vice Media is a media empire that produces magazines, topical reports and video journalism, documentaries, promotion agencies, music festivals and strong support for young artists. By 2016 the company expects to make $1 billion in an IPO, Carsten Kritscher, Vice Media Commercial Director revealed at the Digital Innovators' Summit in Berlin on March 24 and 25. This story catapulted the team into the spotlight and helped to land it a contract with U.S. cable TV channel HBO, which is now broadcasting their documentaries. 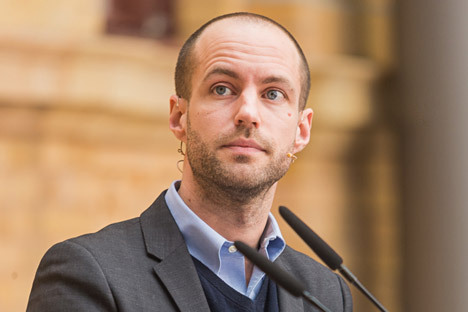 Carsten Kritscher,Vice Media Commercial Director (Germany) spoke to RBTH about the company’s obsession with Russia, its political stance and the role of the media in international relations. RBTH: How do you explain your obsession with Russia? Carsten Kritscher: Well, we love Russia! The first ever DVD Vice Media released was featuring footage of my Trans-Siberian trip. It was followed by a story about radioactive animals of the Siberian taiga, then we exposed the behavioral patterns adopted on board Russian trains. Even though we have not changed the narrative style over the years, I admit that our reports from Russia have grown more politically oriented of recent in response to the global events we highlight. Two years ago we launched our Vice Russia project. We station a crew of 15 in Moscow. We are fit to engage in a full range of operations – starting with journalist investigations through in-house creative services like strategy development, film production, and advertising. RBTH:Vice caters for a very young audience, most of your fans are aged from 13 to 38, and are predominantly male. The Onion, another American resource, a comic site that comes close to you in spirit, has repeatedly made fun of Americans knowing next to nothing about Ukraine and ignoring the Crimean crisis. The audience they broadcast for is just a bit older than your viewers. Why would you think that Vice viewers fancy watching news about Ukraine? C.K. : We are committed to a particular style of reporting that is unlike the one adopted by The Onion. We run Vice News. In early March our Moscow team spent two weeks in Ukraine doing what we call an immersion-experience video. The guys did a house-to-house, meeting people, asking them to tell their stories, while refraining from commentary or add-ons, thus crossing the self-styled borderline between the two countries. We do not claim to understand Russia better than other international media do. And I have a feeling that Russians do not fully understand themselves anyway. But what we offer puts us way ahead all other media: we show Russians and Ukrainians telling their own stories. That is why we are better than other media. RBTH: It is amazing how much the style of your Crimean reports differs from what the Wall Street Journal or the Washington Post feed to us. Those media openly take sides, and you seem to steer clear of allegiances. Is it because you want to avoid involvement in information wars? C.K. : Oh, that one is easy. We are not a politically engaged resource. We do not belong to either right, or left, or center. We are Vice, we stick to our own philosophy. This may sound fresh, I admit, but this is the truth. What we seek is a good story and that is our commitment, and for that reason we still can call the shots. RBTH: Did you ever happen to face any issues with politicians or state bodies in Russia, was any pressure put on you, either legal or financial? C.K. : If so, I am not aware of it. Still, if you saw Simon Ostrovsky's reports from the Crimea, you won't be surprised to hear what we encounter when shooting our videos, it is more in the way of camera blocking, yelling, obscenities, throwing stones at our crews and so on, you name it. RBTH: In short – you meet with the same welcome as any other reporter. OK. Imagine that Russia evolves into a pariah state not unlike North Korea. Will Vice stay in Russia? C.K. : That's a tricky one! You know what, we will stand by you, we will always stream our reports from Russia and keep telling cool stories from all parts of the world. But honestly, I do not think the plot you have devised will ever come true. This is my personal opinion. RBTH: Jokes aside: do you think that media makes a difference for international relations? C.K. : Well, there is no point to argue. Of course it does. Many documentaries triggered no-nonsense international squabbles, those documentaries were made by the media and got a high profile through the media to fuel public discussions. Media have always had a strong hold on the public and will always retain that hold. In the long run it's people like you and me who are the end-users. We don't have much choice in shaping our outlooks but build on what is displayed by the media. If you don't believe your own newspaper, drop it and read another one. Your channel talks rot? Watch another one! RBTH: What drives your choice of Russia-related topics? C.K. :Our bureaus in each country are led by editors-in-chief who use their own discretion. However, they are all guided by the general principles upheld by Vice: Expose your viewers to burning, catching experiences; respect your audience; give them all the cards; make their lives colorful; make them eye-witnesses. Our audience is grateful to us for such treatment, responding by promoting Vice-style mores. We wish for nothing better.